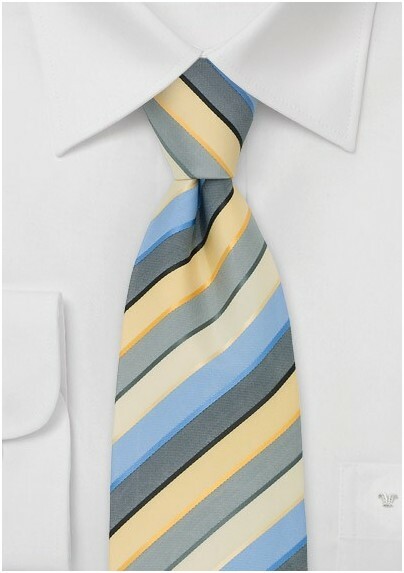 Add color and unique design to your summer business look with this three-tone striped necktie by Puccini. 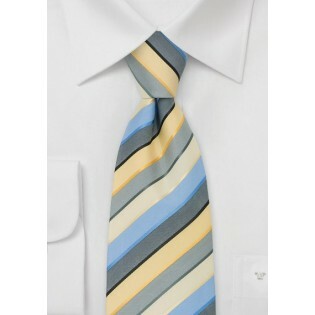 The yellow and light blue stripes are perfect for the sunny summer days while the gray stripes allow this tie to be matched with any suit in gray to black. There are many nice shirt and suit combinations for this tie. We suggest you wear this tie with light blue dress shirt and a tan colored suit - a perfect summer looks that is squally suited for business attire as well as leisure wear. Made from microfiber.